The Dresser Formation in Western Australia contains evidence of some of the earliest signs of life, dating back almost 3.5 billion years. In the 1970s, scientists discovered the remains of layered microbial mats called stromatolites there, which they thought had formed within an ancient volcanic caldera, submerged under seawater. New research, however, suggests that these early cells thrived not under the ocean, but rather on land, within hot springs. Martin Van Kranendonk, a member of DCO’s Deep Life and Extreme Physics and Chemistry Communities, Tara Djokic, a member of the Deep Life Community (both of University of New South Wales, Australia), and colleagues discovered microbial biosignatures and minerals matching modern hot spring environments within the Dresser Formation. These findings, which researchers report in a new paper in the journal Nature Communications, suggest that microbial life in terrestrial hot springs existed about 3 billion years earlier than previously known . 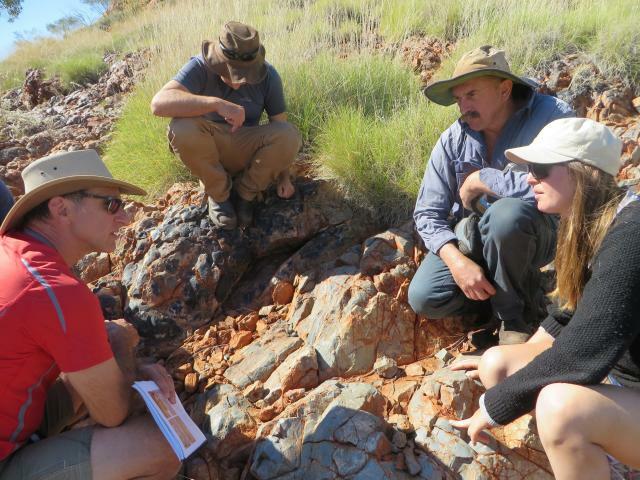 The Dresser Formation is a well-preserved section of the Pilbara Craton, a 3.5 billion year old section of crust. While doing fieldwork at the site, graduate student Djokic picked up an unusual rock with thin, alternating layers of white and black minerals. Further analysis revealed the rock was geyserite, which forms only around hot spring environments; from the mineral-rich liquids that splash out of geysers. Additionally, the group discovered new evidence of bacterial life, including preserved stromatolites in the form of dome or cone-shape structures made up of layers of sediment and photosynthetic bacteria. They also identified palisade fabric, quartz minerals that form around bacterial filaments lined up like slats on a fence. The samples look highly similar to preserved palisade fabric from an active hot springs environment in Te Kopia, New Zealand. The researchers also discovered what appears to be gas bubbles trapped in the sticky extracellular polymeric substance that bacteria secrete when forming a biofilm, which later mineralized. When combined, these observations point to thriving bacterial communities utilizing the chemical energy in the hot springs system. The new discovery shows that life existed on land early on in Earth’s history. The next oldest set of fossils from a hot springs environment is just 400 million years old. Van Kranendonk proposes that a hot springs environment, much like the one within the Dresser Formation, is the most likely location for life to originate. Unlike marine hydrothermal vent systems, which represent another top contender for the “cradle of life,” hot springs have wetting and drying cycles that occur when geysers erupt, which can bind together chains of macromolecules, a process that scientists have not demonstrated in marine hydrothermal systems. Additionally, cells have ratios of potassium and sodium ions that match freshwater but not seawater ion concentrations, said Van Kranendonk. Hot springs can also concentrate elements like boron, phosphorus, and manganese, which cells need to make complex organic molecules. These deposits offer clues for finding similar sites on Mars that may support microbial life. Van Kranendonk is working with NASA to advise them on the landing site for the 2020 Mars rover. Naturally, he advocates for a known former hot springs environment, the Columbia Hills site that the Mars Rover Explorer Spirit discovered. Columbia Hills is among NASA’s top three selected sites.